The whole offseason, Fire Squad Elite was waiting...and waiting until BANG. Right as soon as the season starts they are in the lead before the turn. Picking up their 1st W (96-83) over Tha Crew. All starting five were in double figures and at one point, were up 20 points. Tyler Converse ended with 22 points & 8 rebounds. Zach had a double-double of 16 points and 12 rebounds. With the new additions, they were able to reach second in points per game with (96.0) and second in steals at (7.0) it also allowed everyone to play freely considering everyone on the squad has good ball skills. I see this team being a legit contender for a title and trouble for Impact Basketball. In the No. 2 spot (first in points per game with 123 and second in assists with 27.0) Impact started out with The Hoopers and handed them a 50-point loss. Beau Barney and Imran Sufi combined for half of 123 points scored, Beau with 40 and Sufi with 20. Both making top performers this week and getting back to putting up 100-plus as a team. This team has a little more swag with Rob and Sufi on it, plus Andre Hines came in with 3-4 dunks mid game to breaking the hearts of the Hoopers after gaining a little steam. The team making the trip from down show is MGTOW and making in count with their first win of the season. 96-58 over the Under Dogs. This team lucked out with the rescheduled games. Hey for a tune up game Jaden Courage let them have it by dropping 32 points showing he will be one of the lead guys this season. From start to finish this kid didn't stop running. Patrick Dudley was a huge pick up for MGTOW last minute chipping in 16 points, 13 rebounds and 4 assists. This team ended week one first in points allowed (58.0), rebounds (63) & assists (29). I’ll start them out at No. 3 with Long Shots on the table next it should give us a better idea of what Aaron Lohmann and MGTOW boys are all about. It’s been awhile but Oh Boy starts the season off with a W and had 6 guys suited up for the game, double victory. Second in points allowed with (70.0), rebounds(48.0), steals (7.0) and blocks (6.0). Oh Boy let Bucket Getterz hang around till they out kicked them to the finish by 13. Vince Rogers in his first Ultimate Hoops game had a good day and messed around and got the triple double plus was 100 percent from the field. Top Performer no doubt in my mind, the glue that will help this team stick in the top all season long. We also had a Eric Belsar sighing in some open runs; if he returns to Oh Boy it may be the final piece of the puzzle. Tha Crew came up short (83-96) to the Fire Squad. Both additions A.J. Soto and Jeremy Vaughn started out a little slow then picked it up in the second half. All players were in double figures with Duval Johnson leading the team with 22 points and 9 rebonds. Randle finished with 19 points for a good first fall game. The real story was the turnovers they had and missed opportunities. They had 9 turnovers and when they could of made it single digits and Cay missed a huge dunk that might of swung the game around. I have no worries for this team, by Week 3 they should be rolling after getting time to jell. Erick had a huge offseason, picking up guys for the Bucket Getterz but got hit by the flu bug losing 2-3 guys and one to vacation but was able to get enough for a game. Taking the L to Oh Boy, they were still able to put up a fight. Berto Lara had 11 points, 6 rebounds and 3 assists. Erick had 9 points, 6 rebounds, 3 assists and 2 steals. They should be ok through out the season with the return of Preito and Jason. 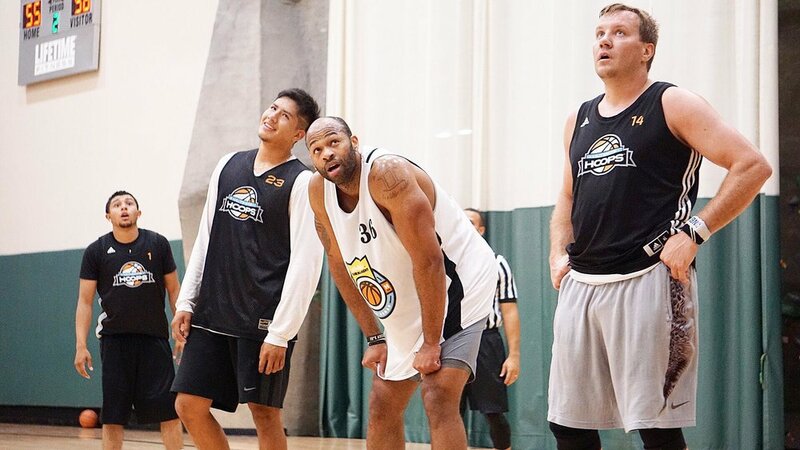 The Hoopers flat out ran into the Usain Bolt of the league night one in Impact. With no D.J. ( M.I.A.) and Mitchell this season they had nothing for the defending champs. I am not going to say they just let Impact win but, they only had 2-3 fouls all game so there wasn't much resistance. We may need to see a trade or a new addition in order to get them going. This maybe a rebuilding season for these guys. Under Dogs were in it for a while till the wheels fell off with about seven minutes left in the first half. After having a huge Summer Season, Rodney couldn't seem to get any looks in this one. As time went on it became "let’s see who could miss the wide-open three". Shot selection and not letting games get out of hand are going to be keys for these guys. Finally roster full and starting Week 2, let's what these boys bring to the table. Derek Elliot was one of the top 15 players in summer with Joey Mclain and Vet Griffin Yopp. They should be a tough match up every Tuesday. Ramos has got some work cut out for him considering he won't have the same talent as summer league. Plus they are a week behind it may help them or hurt.